A Philadelphia Guy's Blog: First Post-Treatment Scan Incoming! Let the scanxiety begin, its time! I get my first post-treatment PET scans next Monday. 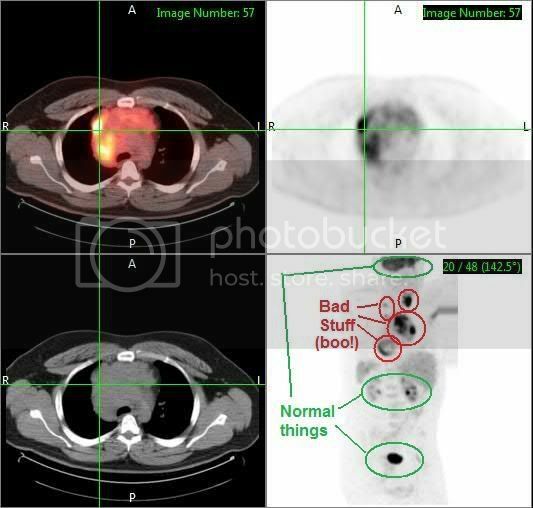 For those who didn't follow the original blog, PET scans involve getting injected with a radioactive sugar. Cancer cells apparently chow down on sugar faster th an most other cells in the body, so you get the injection, hang out for an hour, then get a scan. Cancer pops out on the scans as black masses. Here's a copy of a PET slide from my diagnosis back in October to show you what I mean. Here's the situation: The odds are spectacularly in my favor that it will be nice, clean, and boring. We're talking 95% or so chance its clean. However, if you're going to relapse from Hodgkin's, its going to usually be in the first two years (after that, its Double Secret Probation rare). Second, if you're going to relapse, you really don't want to do it in the first six months. To put it bluntly... The odds ain't good, even with secondary and tertiary treatments. So yeah, Suzanne and I are a little scared going into the scan, great odds or not. Now, its not a guaranteed death sentence if this doesn't go well. We can still be cured with a stem cell transplant (using my own stem cells - rest easy Brian, Tracy, and Billy haha, you're off the hook still haha). However, THAT cure rate is a coin toss - about 50%, and being diagnosed in the first 3 months makes it worse. That's not to scare anyone, that's just the stone cold statistics of the thing. And an explanation on why Ativan is my friend at night again. Again, the expectation of everyone (including my oncologist) is this will be perfectly fine. However, that doesn't take the fear away for one minute. Sometimes I wonder if that nagging fear will ever go away completely. Believe it or not, that fear will go away with time. I only had six months of remission, but, I found (even while I was relapsing), that each month that went by, got a little better, a little easier. I, as well as your onc, and I'm sure many others believe you will be good to go, come your scan date. It's never an easy day, and your feelings are totally understandable. I think we'll be going in the same week, if my calculations are right? I'm heading in on the 21st. Hopefully, I'll be able to follow your footsteps, with good, clean, scans.